Pod2G: Evad3rs Release Untethered Jailbreak for iOS 7! Sunday is funday! 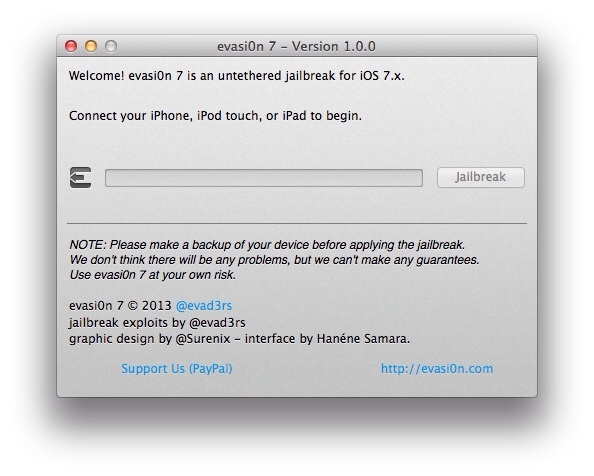 Out of nowhere, the evad3rs have released the iOS 7 untethered jailbreak for all iOS devices. evasi0n 7 as it is called, supports all iOS devices running iOS 7 (including the latest 7.1 betas). All iOS 6 users are free to upgrade to iOS 7 now, however this release has even caught saurik (Jay Freeman) the maintainer of Cydia off guard as he claims Cydia has not been tested thoroughly and Mobile Substrate do not work correctly. So all of our favorite tweaks probably do not work yet. As always, please backup your device first. If you want an iOS 6.1.3+ jailbreak, hold tight as iH8sn0w is planning to release a tool with these exploits to jailbreak those devices (evasi0n7 does not support anything below iOS 7). This means they are going to have to push a new version of their untether to fix this oversight before I can push newer builds of Substrate. It appears as though in China, instead of Cydia being installed by default, the evad3rs have preloaded a Chinese 'app store' called TaiG which contains cracked applications. Not much is known about this store and besides piracy there are concerns that it may access user data. We highly recommend those in China do not install it until more details are known. Please see this article for updates. All donations will go to organizations such as EFF, and PublicKnowledge that fight for digital rights and liberties. We'll have tutorials out for all devices soon.